Madeleine answered the call in true Madeleine fashion going spare, strike to win by one pin. 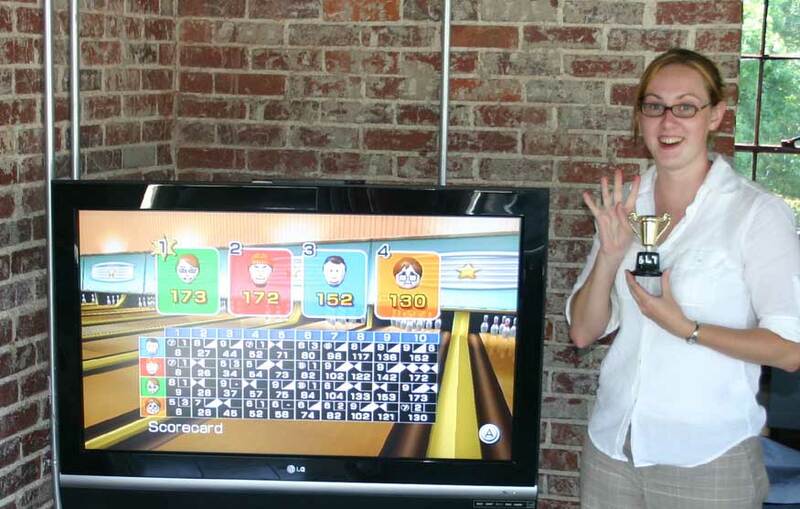 As we all waited for the Wii to post the scores you could cut the tension in the conference room with a well sharpened spork and when the one pin victory was displayed- tumult. Where Boring Goes to Die? The Greatest Thing Since Nails? A couple of other quick items of note from BLT. There is no clear definition for a Snack Pack. It can be pudding or cheese or whatever. The proper way to eat a Handi Snacks is to cut the cheese into four equal squares and spread evenly over the four crackers. Correction, the proper way to eat Handi Snacks (the ones with the red stick) is to scoop the cheese out in one lump, swallow cheese, and either throw out the crackers or trade them for a penny a piece. Evan - "There's a new sheriff in town." Who cuts the cheese in a Handi Snack? I simply take the red applicator and scrape the cheese product in four straight horizontal lines. I've never thought to do it any other way. I once thought that just diggin into the cheese was normal, only to realize after years of wisdom that the fourth cracker is often left uncheesed and useless. There's a new Sheriff in town... classic! You should post all BLT scores so people who live in, lets say, Aiken can feel like they're a part of it. That is all. Thank you.